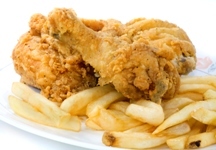 A new study says that regularly eating deep-fried foods, like French fries, fried chicken, and doughnuts, is associated with an increased risk of prostate cancer. This link is slightly stronger among the more aggressive and fatal forms of the disease. This follows in the same mindset of other studies that have found cooking meat at high heat can raise the risk of cancer. Here, for the first time, deep-frying was added to the occasion. It found that men who eat these types of less-healthy foods at least once a week were at a 37% increased risk of prostate cancer compared to men who rarely ate them. This held true after accounting for other risk factors. Why do these foods increase the risk for prostate cancer? It is possible that when oil is heated to temperatures suitable for deep-frying, potentially carcinogenic compounds can form in the fried food. They include “acrylamide” (found in high-carb foods, like French fries), “heterocyclic amines” and “polycyclic aromatic hydrocarbons” (chemicals formed when meat is cooked at high temperatures), “aldehyde” (an organic compound found in perfume), and “acrolein” (a chemical found in herbicides). These toxic compounds increase with re-use of oil and increased length of frying time. Doesn’t sound too tasty! RECOMMENDED: Wading further into fried foods. Foods cooked with high heat also contain high levels of “advanced glycation endproducts” (AGEs). AGEs have been associated with chronic inflammation and oxidative stress. Deep-fried foods are among the highest in AGE content. A chicken breast deep fried for 20 minutes contains more than nine-times the amount of AGEs as a chicken breast boiled for an hour. Deep-fried foods have previously been linked to cancers of the breast, lung, pancreas, head and neck, and esophagus. Most often, deep-fried foods are consumed outside the home. So, it may come down to making wise choices when in restaurants, and avoiding those that primarily serve fried foods. Miller, M., et al., “Consumption of deep-fried foods and risk of prostate cancer,” The Prostate; first published online January 17, 2013.